Today is National Chocolate Cake Day! 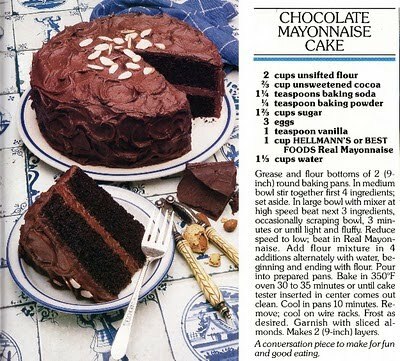 So to celebrate the holiday I thought I'd post three great recipes for Chocolate Mayonnaise Cake. I've posted about chocolate mayonnaise cake before. You'd be surprised how many recipes there are. Seems like everyone's Aunt Sadie had a recipe. 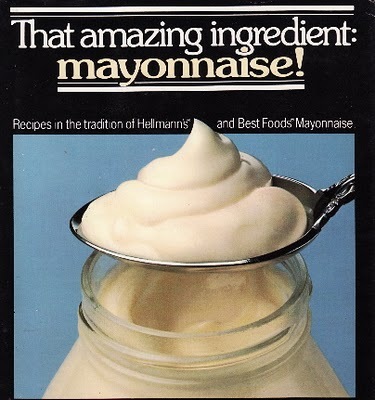 But it shouldn't be a surprise to you that mayonnaise was used so often in past generations. Do you remember mayonnaise in jello molds? That used to be a staple at special occasions all over the U.S. If you don't remember, be glad! But in cake, it really works! As I said there are many recipes for Chocolate Mayonnaise Cake. 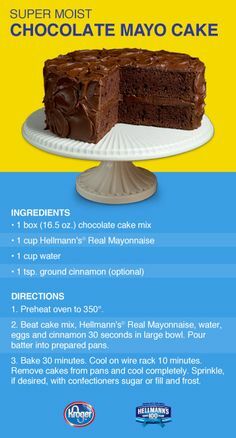 Here are two Retro recipes for Hellmann's Chocolate Mayo Cake and a newer recipe for a Chocolate Mayonnaise Bundt Cake. I have found several of these ads over the years--some recipes use eggs and some don't. I think the earlier recipes must be from the 30s and early 40s. Mayonnaise Cakes are really moist, so it's hard to go wrong on any of these recipes. Want to try a variation of the recipes above? Use Miracle Whip instead of Mayonnaise. Totally different flavor. Most people are particular when it comes to the choice between Mayonnaise and Miracle Whip. I still think it's worth trying Miracle Whip in this chocolate cake recipe... or for that matter, in the bundt cake recipe below. Word to the wise: don't taste the batter before it's baked. It will seem a bit odd, but the final results will be delicious. And, just for good measure, here's a third recipe for Chocolate Mayonnaise Cake! Mix in vanilla, mayonnaise, egg, and water-- just enough to get all ingredients blended. Pour into greased Bundt pan. Bake at 375 degrees for about 35 minutes or until toothpick comes out clean. I am of an age when I can remember cakes being served with mayonnaise as the secret ingredient. (A la the tomato soup cake!) How about in that last recipe for the bundt cake - it calls for the addition of a whipped egg? Do you think lightly beating would suffice? All three recipes sound delish, and I can never turn away from trying a new chocolate cake recipe!